St. D'vencE 100% Pure and Natural Olive Oil in its purest form is loaded with vitamin E and antioxidants that make it a perfect choice for moisturizing the body. It exfoliates the skin by penetrating deep into the skin and removes dead skins. The nutrient rich oil is quite effective in delaying the signs of ageing, so lesser fine lines and wrinkles appear with regular use. 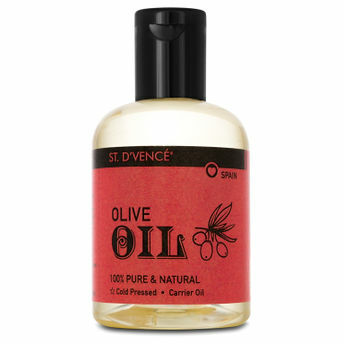 When used for hair, it reduces hair fall and its continuous use keeps hair moisturized with a softer appeal. It blends seamlessly with essential oils or any mix-ins. Major source of Omega-6 & Omega-3 fatty acids and powerful antioxidants, that moisturize and absorbs easily without greasy after-feel. Rich in Vitamin A, it works excellent as a skin nourishment and can be used as a face and body moisturiser as well.